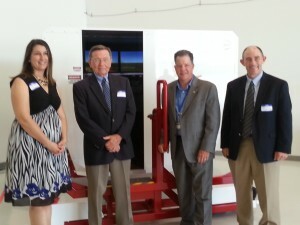 L-R: Lisa Lynch, AAMO General Manager; John Keich, Alpha Flight Simulation Owner; John Bales, Director of Aviation at Spirit of St. Louis Airport; Tom Cargin, AAMO Owner. On June 20, Alpha Flight Simulation, with Air Associates of Missouri, cut the ribbon on its brand-new Redbird MCX Flight Simulator at Spirit of St. Louis Airport in Chesterfield, Mo. The simulator, leased by Alpha Flight Simulation to Air Associates, is the first of its kind in the Midwest, and is only the 14th produced by Redbird. This model has a variety of upgrades not available on other Redbird simulators in use, and is targeted to commercial and general aviation pilots at Spirit and the surrounding area. Scott Thompson, Chief Flight Instructor at Air Associates, says the simulator fits perfectly with the “Learn, Sim, Fly” training philosophy used at the school. For more, see the full report by Carmelo Turdo at The Aero Experience. This entry was posted in Alpha News and tagged Air Associates of Missouri, Redbird, St. Louis on June 21, 2013 by Alpha Flight.